It’s nice to see successful RPG studios sharing their tech – reminds us of the late ‘90s, when for a little while the Infinity Engine powered anything with a rulebook. 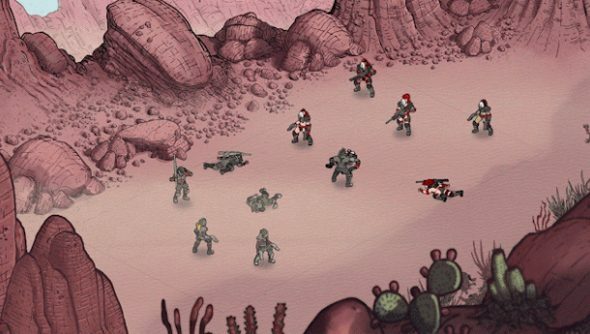 Obsidian have loaned out the Pillars of Eternity engine for Torment: Tides of Numenera, and now Banner Saga types Stoic have lent their tech to Bedlam – a permadeath, post-apocalyptic roguelike with acronymical ambitions to marry FTL and XCOM. It’s a strong pitch – particularly on the art front, where developers Skyshine are able to draw on the talents of Vigil Games art director John Mueller and Darksiders lead visual effects artist Sam Gage. The premise is “Fallout on wheels”, in the words of Obsidian’s Feargus Urquhart. Bedlam is a rolling post-apocalyptic adventure told from the back of a mobile fortress named the Dozer. Each campaign is designed to be played through in a single session. You’ll need to travel from the future metropolis of Bysantine, through the chaotic wasteland of Bedlam, to the mythical utopia of Aztec City. You’ll want to keep your Dozer running, and as much of your crew alive as possible – but permadeath is going to make that tricky. Encounters and discoveries are randomly generated as you venture into faction-controlled territories and overturn their Points of Interest. “Stoic is excited to support Bedlam with our engine and eager to see what Skyshine Games can do with it,” said The Banner Saga’s John Watson. What Bedlam gleans from The Banner Saga is a turn-based tactical battle system – but Skyshine have ditched that game’s turn order system entirely. Any member of your crew can be selected and moved in any turn. Skyshine call their fights “carnage-filled chess” – citing different classes with their own movement distances and optimal damage ranges. The Dozer is unseen on the battlefield, but plays an essential role. With upgrades, it can be used to buff fighters, call in reinforcements and fire devastating single-shots from the side of the ring. Gosh, I hope this gets funded. At the time of writing, Skyshine have collected nearly $56,000 of their $130,000 goal with 23 days to go. Do you think they’ll make it across the wasteland?